Once defined by rural stereotypes and wide-open spaces, Des Moines has attracted hundreds of new startups to its revitalized downtown neighborhoods in the past few years thanks to one big factor: Its stable economy. With an unemployment rate of around 6% and a cost of living index that falls nearly 9% below the national average, the city has seen an explosion of small manufacturing firms, green tech startups, and social media upstarts bloom around its longstanding insurance and financial services sectors. 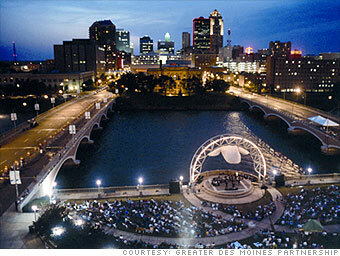 More than 70 insurance firms are headquartered in Des Moines; its largest employer is Principal Life Insurance. The city's biggest business expense is the state corporate tax rate, which tops out at a whopping 12% for firms with net income of more than $250,000. However, Des Moines offers a half-dozen tax incentive programs for new companies, including credits and exemptions for businesses that make a capital investment of $500,000 and create at least 10 new jobs. What do you think of Des Moines?